Unique loose leaf book, primrose yellow cover tied with orange and grey string. Two end pages of grey cardboard. 24 pages of scarlet Ingres paper, 29.5 x 21 cm, with colour xerox copies of works from sketchbooks glued on to them, images measuring 29.5 x 10.5 cm, predominantly soft greens, ochre and darker cypress green, allow red borders of backing paper to show on either side. 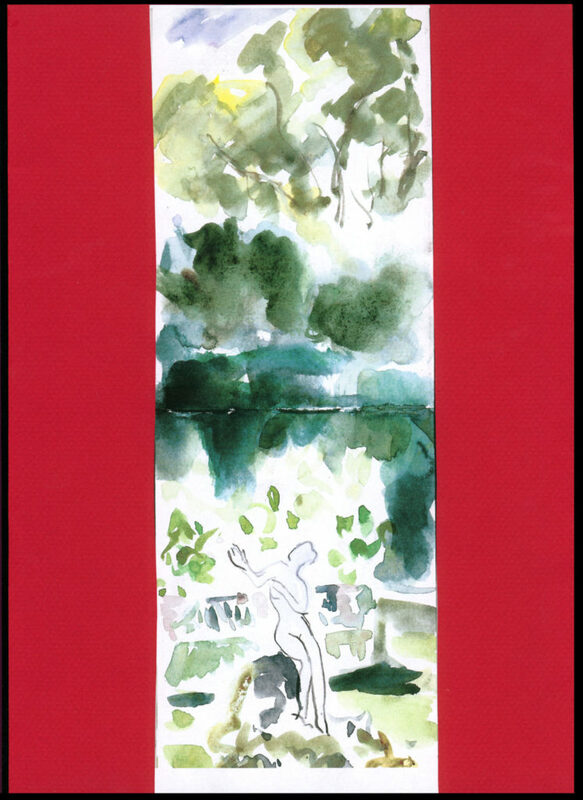 The images are of statues, trees, reflections in the gardens of Hadrian’s Villa at Tivoli, Ninfa near Rome and Boboli Gardens in Florence, all painted over a week in November 2004. The pages are interleaved with powder blue tissue paper 29.5 x 21cm and smaller strips of the same tissue paper and of grey Ingres paper with quotations hand-written in red ink from poets and writers: Keats, Marguerite Yourcenar, Flaubert, Marvell, Marina Warner, Frank O’Hara.